A Porsche for the price of a Japanese import coupe! 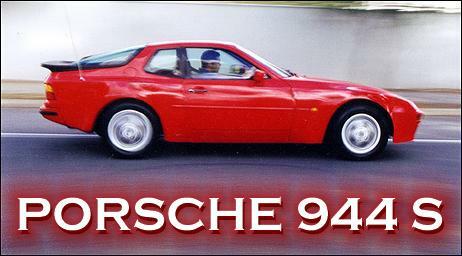 The first Porsche 924/944 shape appeared in Australia all the way back in 1977. Its immediate appeal to the marketplace was mainly attributed to its practicality and affordability - especially when compared to the more exotic 911 and (later) 928 models. Many Porsche purists looked down their noses at the sports car originally to be marketed as an Audi, but over the years the car became more and more 'Porsche' and less and less Audi/Volkswagen. One big jump was from the 924 to the 944, the latter having a heavily restyled body to go with the upgraded mechanicals. It's for this reason that quite a lot of 944s were snapped up in the early years, and Porsche soon saw fit to release the first warmed-over model in October 1987 - the 944 S. Its respectable sales mean it was superseded in late 1989 by the 3 litre (155kW) 944 S2. MacPherson struts (with a sway bar) suspend the front of this vehicle while a trailing arm IRS with transverse links and a sway bar are to be found at the rear. Like the Alfa Romeo GTV6, the Porsche uses a transaxle located between the rear wheels to aid front-to-rear weight distribution. In fact, the balance is nearly 50:50, which goes some way to explaining the car's very good stability and cornering response. Certainly, the 944 S is based on the same underpinnings as the original 924 - however, it is much more refined and developed. It's not a soggy sponge, that's for sure. 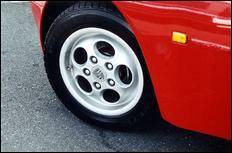 Braking wise, the car is equipped with four-wheel discs and these stop the car powerfully. Anti-lock brakes were not available. A traditional looking set of Porsche five hole 16 inch wheels fill the guards bountifully - and while we're at it, that's one of the 944's main distinguishing features over a 924. Nine-four-fours are quartered by four bulging, boxed guards that project a much more serious attitude. There's also a lower front spoiler with fog lights and a standard rear spoiler - which go towards a respectable-for-the-time aerodynamic Cd figure of 0.35. The cabin of the 944 is also much improved over the 924. 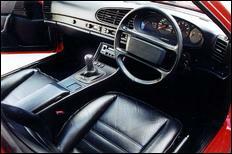 A dash similar to contemporary 911 and the 928 S4 contains a comprehensive array of instruments and a styled steering wheel (which comes close to tall person's knees) is also included. Each 944 S has leather trim, power windows, mirrors, air, power steer and a power driver's seat. Both front seats are set very low - you really sit down in one of these cars. Rear seat passengers - if they aren't heavily into yoga - will most certainly complain about limited head and leg room. Add all the 944 S's components together and you have a total weight of around 1200kg. Porsche is usually noted for their awesome flat sixes and V8s, but the 944 S's water cooled in-line 2.5 litre four is very respectable for an atmo motor. It's actually a direct descendant of the 928 model's V8 engine (essentially one half of it) and, not surprisingly, both scored DOHCs and 4 valves per cylinder at the same time. Fuel and ignition is controlled electronically by a Bosch DME (Digital Motor Electronics) management system working with a single ignition coil. The 944 S's power output is 140kW at 6000 rpm, which is 22kW up on the contemporary 924 S, while torque is listed at 230Nm at 4300 revs. This added power and torque comes from the use of a twin cam 16-valve head, a compression ratio raised from 10.2 to 10.9:1 and a "special tuned-intake pressure charging system". However, the 944 S will only deliver these 140kW and 230Nm figures if it's filled with 95 RON fuel. Using normal 91 octane ULP will cost around 6kW. A 5-speed manual gearbox comes mated to the 2.5 litre powerplant - autos were never an option. 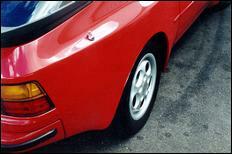 When new, the 944 S was quoted as being capable of accelerating from zero to 100km/h in 7.9 seconds. That made it more of a thrill to drive than the normal 944, which took 8.4 seconds. 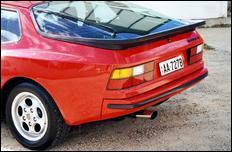 Under hard straight-line acceleration, the rear end of the 944 S squats noticeably. A claimed top speed of 228 km/h was delivered. In normal driving, the 944S doesn't really sing below about 3500 rpm, but its good torque means it keeps up with traffic flow without the driver needing to row through the gears. Turn the wheel connected to the power assisted rack and pinion steering and the 944 S attacks the apex virtually instantly. From there, it sits balanced and is very controllable with the steering and throttle - it just depends how fast you want to go. Some tests suggest the car can be a bit twitchy, but its cornering speed at that time is generally high. 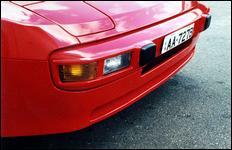 The 944 S is a car that demands total driver concentration near the limit. 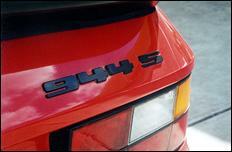 Being the sportier variant of the 944, the S has a firm ride and it does have an annoying tendency to tramline. The best thing to do is simply let the wheel wriggle gently in your hands. Standing next the car at the fuel pumps it's revealed that the car does drink at a fair rate. Porsche literature says the car will return 12.6 litres per 100 km in urban cycles and 8.6 litres per 100 at a steady 90 km/h. The latter is particularly high - most cars at a constant 90 km/h can do much better than this. 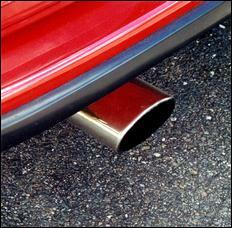 As per usual, the first area to look at for more power is the factory exhaust system. It's not particularly bad in the Porsche, but it is a compromise weighted in favour of low noise and good longevity. Trade off some of the last two and go for a high-flowing mandrel bent system (no less than about 2½-inch diameter) with a high quality cat converter and good mufflers. That should deliver around another 5-10% power over stock. Looking under the bonnet, the factory airbox appears pretty well sized, but the cold air intake could be improved for another couple of kW. Of course, for maximum performance, always fill the tank with high octane unleaded. A Porsche 944 S always looks hot (but watch the body colour - it can look a bit slab-sided these days), but you can easily add to its visual appeal by changing the wheels. The right set of 17s or 18s (with appropriately wide rubber) will make the most of the bulging guards, and by experimenting with different tyres you can also lessen the car's inherent tramlining. A new set of Bilsteins will improve handling noticeably - there's a heap of aftermarket (and factory high performance) parts for the Porsche, but here in Australia they'll cost you quite a bit. Released in October 1987, the 944 S was sold alongside the normal 944 and continued sales in Australia through until February '89. It was then replaced by the 3 litre 944 S2. Off the showroom floor, the 944 S retailed for oh-so-close to $100,000 and came with options such as heating and an orthopaedic lumbar support for the spine. Today though, they can certainly be bought at a deflated price. The average 944 S will sell for $25,000, while even a low kilometre on with full service records will cost around $30,000. They last well with time too. Mechanically, the engine has a reputation for reliability, but as with any car that was expensive when new, it's preferable to lean towards cars possessing a full service history. Look for corrosion in the cooling system and the appropriate changing of the cam belt - but there are no known common problems. 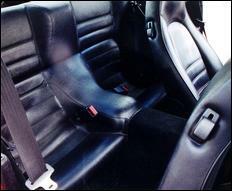 The leather seats - even in cars with a lot of kilometres - remain in reasonably good condition. A high level of build quality is still very much evident - unless you're looking at an absolutely neglected example, the doors will still shut solidly, there won't be any major rattles and nothing will be broken off. Before buying any performance car, it's a good idea to ring around for insurance premiums. As an affordable Porsche with some decent performance, the 944 S is a winner. A contemporary Porsche sales brochure sums it up by stating, "it combines a sense of sportiness and good sense per se. The sheer pleasure of high performance and the desire for excellent day-to-day driveability both receive their due in the 944." Fair enough! If you want decent performance, involving handling and reasonable practicality - and you want a Porsche - the 944 S will deliver. Largely due to changing fashions, a good example can be bought for very reasonable prices. But be prepared for the possibility of expensive mechanical work - any car that cost a hundred grand brand new isn't going to have very cheap new part prices! The 944 S is an affordable (to buy! 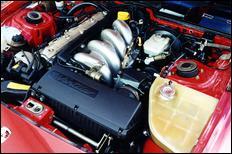 ), exotic high performance machine.